Worldwide aprrox. 10.8 million people per year are diagnosed with cancer and around 6.7 million die of it. UKRAIN has so far been tested on 160 cancer cell lines and demonstrated a toxic effect against all of them. Among other institutes UKRAIN has been tested on 60 cell lines at the National Cancer Institute (Bethesda, Maryland, USA) including eight important malignant human tumours: brain tumour, ovarian cancer, small-cell and non-small-cell bronchial carcinoma, colorectal carcinoma, kidney cancer, leukaemia and malignant melanoma. UKRAIN was toxicologically effective against all of these cell lines. At the same time, studies at various universities have shown that UKRAIN does not damage normal cells at comparable doses. UKRAIN can bring about a full regression of the main tumour and also metastases. In the treatment of advanced tumours UKRAIN can improve overall quality of life and prolong survival time. The first patients to have been treated with UKRAIN are still alive after more than 20 years. Randomised clinical studies have confirmed its effectiveness against malignant tumours as well as its beneficial immuno-modulating properties. while leaving normal cells undamaged. The proofs of this are in the letter. H U M A N R I G H T S ? As a child I experienced the war and was also in a concentration camp but what I was forced to experience in September 2012 was not comparable. During the war all forms of reason were destroyed – brother fought against brother and neighbour attacked neighbour. On 4 September 2012 more than 50 officers stormed our house, took away the key to our flat and put me in prison, where I had to spend six weeks. These 50 officers then terrorised my family for two weeks and took away all our money, including our children’s savings books. We still do not know exactly what was confiscated and I have still not received a list of confiscated goods. Stalin tormented millions of people with such methods. We should not remain silent about this. The public has a right to know who deployed 50 officials to act so unlawfully at the cost of the state. During a house search at least one officer and one witness should enter a room, sign the search record and then close off the room. Not as in my case when officers arbitrarily rummaged through everything and were able to take me away without showing any form of documentation. I can only find one explanation for such behaviour which is that with my invention – an anti-cancer preparation that attacks only cancer cells while leaving healthy cells undamaged, something that every cancer researcher has been striving for – I have pre-empted the political and economic interests of certain power structures. My first patients have already lived longer than 25 years and even those who used my medicament and have spoken against me during these legal proceedings have ultimately lived for years rather than months. Please go to the following homepage to see how unlawful these accusations are: www.ukrin.com/de/node/287. 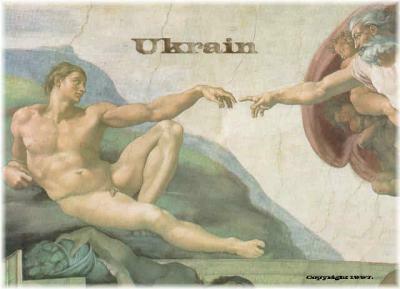 Ukrain is a medicament for cancer therapy. It is produced from greater celandine (Chelidonium majus L.). Corruption is a destructive factor in society and unofficially bypasses the law. Our silence reinforces corruption and we are therefore all responsible for the consequences. In 1993 the Arzneimittelbeirat (Pharmaceutical Advisory Board) at the Austrian Ministry of Health advised the use of Ukrain in accordance with § 42. 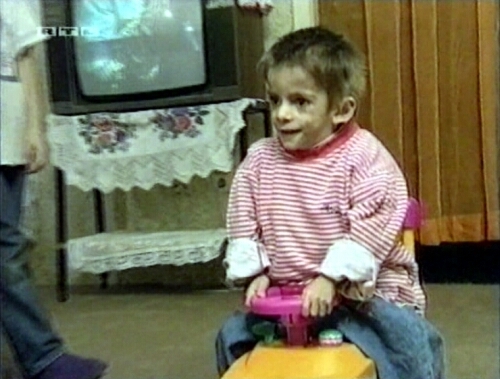 (Link) In April 1995 Stefan's parents came to us with their sick child and a doctor's prescription. 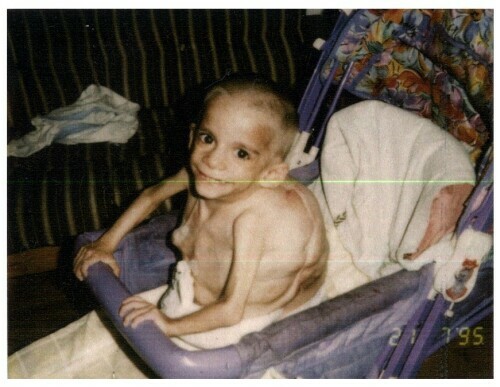 All that could be seen of the child was tumours, bones and praying eyes. Diagnosis – generalised lymphangiomatosis. From the medical records of the Universitätsklinik für Kinderheilkunde, Vienna: "After consultation with our oncologist tumour progression cannot be counteracted either by chemotherapy or radiotherapy. 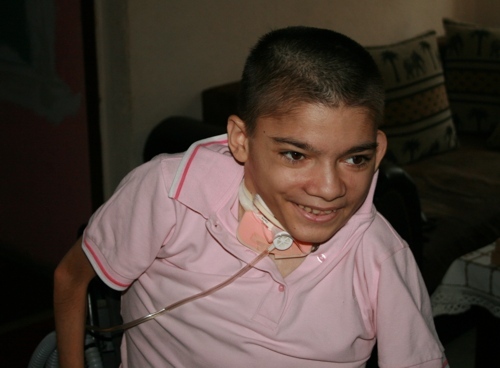 Surgery is also no longer possible so that further therapy can only be palliative." (Link). At the time we did not have the faintest hope of saving the child but did not want to deny his parents' a last chance. Unfortunately the photos taken at the time have mysteriously disappeared. After further Ukrain therapy the tumours almost disappeared. The child could talk, play, walk and even ride a bicycle. A large tumour on his back was removed by surgery but a new one grew in his stomach. From the surgical report on 24 March 2000: "Indication: generalised lymphangiomatose (intraabdominal/thoracolumbal), severe lipomatosis dorsi, severe thorax deformity; … extreme cachexia … The whole back area is arched outwards spherically because of the enormous tumour tissue... The tumour tissue also continues through the wall of the thorax. Radical surgery can certainly not be discussed." The child's condition continued to deteriorate. 5 April 2000 – X-ray examination: "In today's x-ray ... increasingly restricted ventilation of the right lung can be observed." 6 April 2000 – Tapping of ascites with ultrasonic monitoring. "1,600 ml of a yellowish-greenish exudate could be tapped." 20 April 2000 – Tracheostomy (cut in the windpipe with the application of a canula for possible connection to a respirator). 24 May 2000 – Ultrasonic examination: "The liver is considerably enlarged... Pronounced splenomegaly (spleen enlargement)." 3 June 2000 – Patient connected to a respirator. 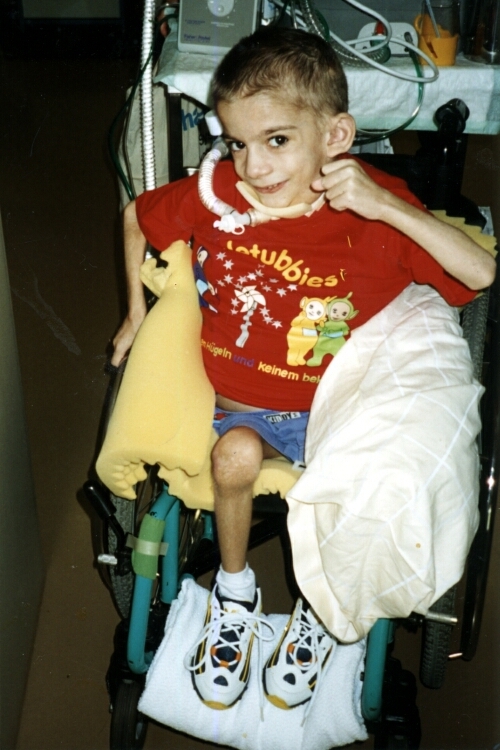 19 June 2000 – Ultrasonic examination: further liver enlargement up to 14 cm. Several lymph angiomas. 23 August 2000 – "Excision of necrotic tissue" (Removal of dead tissue above the right hip). The condition of the child on being discharged from hospital was as follows: "Exsiccosis (drying out). St. febrilis (fever). Decubital ulcera (pressure sores) above the right hip and on the right shoulder blade.. Anemia (1 Ery-concentrate – blood bottle - given). Cachexia (complete loss of strength). hyponatremia (decreased natrium level in blood). Intercostal (between the ribs) and thoracal lymph angioma with generalised lymph angiomatosis. Partial paralysis from Th5 (paralysed by a transverse lesion of the cored). Ascites (free fluid in the stomach). Home respiration therapy (respirator). Tracheostoma (canula in the windpipe). Status on discharge: weight 19.3 kg, waist 61 cm." 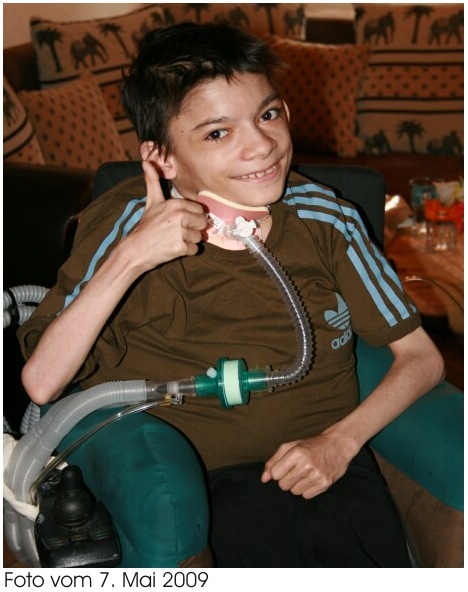 "During therapy the pain has been reduced and all pain killers have been terminated. Breathing has improved and no respirator is now necessary. Severe pressure sores have healed (see photo) and considerable skin defects have been completely covered without plastic-surgical intervention. Tumours in the stomach and other parts of the body have regressed during the course of Ukrain therapy. Stefan is now 17 years old. He is intelligent, can read, write and paint and plays the piano but is unfortunately lamed for life through the incomprehensible prohibition of Ukrain therapy. Stefan is 18 years old.